Regular dental care can reduce your risk for cavities, gum disease, tooth loss, and many other concerns. Dr. Jon Marc Van Slate and his team offer comprehensive preventative services. Our treatments include exams, cleanings, and oral cancer screenings. With preventative dentistry at our Houston, TX, practice we provide simple, proactive treatments that can help you avoid future complications. Even when you are dedicated to proper at-home care, you will not be able to fully protect your smile. Bacteria, plaque, and tartar can build on your teeth in areas that only a professional can reach. This bacteria can cause cavities, and can spread to your gums. If enough bacteria accumulates, pockets can form in the soft tissues, leading to gum disease. This condition can lead to significant tooth loss, gum recession, bleeding, discomfort, and many other symptoms that require proper periodontal treatment to relieve. In addition, gum disease has been linked to an increased risk of heart attack, stroke, dementia, and respiratory issues. Preventative treatments can combat oral bacteria and reduce your risk for these far-reaching health concerns. Everyone should visit the dentist regularly. Even seniors who are missing all of their teeth should have routine visits to prevent gum disease and to check for oral cancer. Children are susceptible to decay, so they should visit us routinely as well. In most cases, we recommend that you come into the office every six months for regular cleanings. However, in some cases, you may want to come more frequently. If you already have gum disease, or if you struggle with recurring cavities, consider making three to four visits per year. These appointments can protect your oral health and keep your smile bright for many years to come. We use digital x-rays, which are sharper and can be magnified many more times than traditional images. Using these detailed images, we can check for any damage or issues that may occur underneath your gums. Dr. Van Slate and his team offer thorough cleanings and exams using advanced dental technology. When you come in for your regular cleaning appointments, your hygienist will remove the plaque and tartar that may have begun to build up on your teeth. Dr. Van Slate will also examine your teeth and gums. He will look for signs of decay, cracks, chips, gum inflammation, and oral sores. For an even more thorough evaluation, Dr. Van Slate will use DIAGNOdent laser cavity detection. 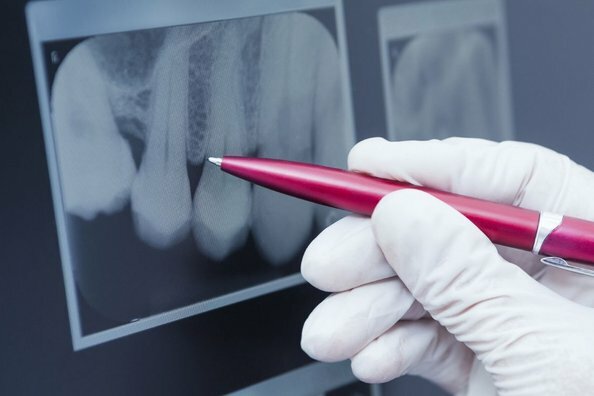 DIAGNOdent can reveal cavities in the earliest stages when they are easy to treat with sealants and fluoride treatments, or small, conservative fillings. In addition, our office will usually take x-rays at every other visit. We use digital x-rays, which are sharper and can be magnified many more times than traditional images. Using these detailed images, we can check for any damage or issues that may occur underneath your gums. We can also perform regular oral cancer screenings during routine appointments. Dr. Van Slate and his team will look for sores, redness, inflammation, white patches, and other potential symptoms of cancer. If you have a persistent or unexplained lesion, we will typically order a biopsy. Oral cancer can be life-threatening, but early detection allows for more successful treatment. For this reason, regular screenings and appointments at our office are essential. Our team is dedicated to providing regular, thorough care to preserve our patients' long-term oral health. To schedule your regular exam and cleaning, contact Dr. Van Slate’s office today.